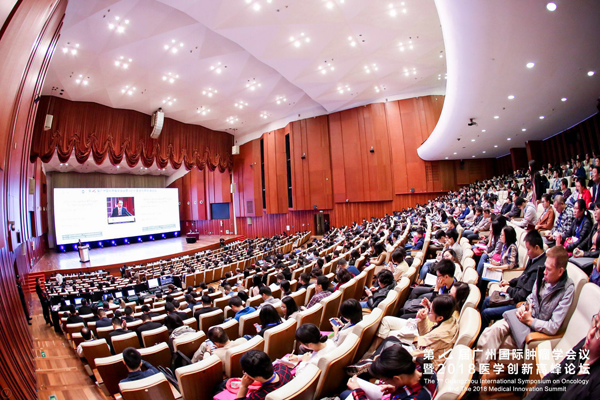 Nearly 2,000 scholars from home and abroad gathered at Baiyun’s International Convention Center in Guangzhou, China, for the seventh edition of the Guangzhou International Symposium on Oncology, and the 2018 Medical Innovation Summit. Held from December 6-8, it was co-organized by the Guangdong Provincial Anticancer Association, the US Chinese Anti-Cancer Association (USCACA), Sun Yat-sen University Cancer Center (SYSUCC), and the journal Cancer Communications. The meeting continued to adhere to the principle of “focusing on the frontiers of discipline development and strengthening academic exchanges at home and abroad” where leaders of domestic, European and American cancer centers shared their latest research results and international advancements in oncology. Vice-president of SYSUCC Professor Zeng Musheng presided over the opening ceremony, where Academician and chairman of the China Anti-Cancer Association, Fan Daiming, delivered a speech in which he pointed out that cancer treatment cannot rely on single-handedness and must integrate various disciplines to drive progress forward. President of SYSUCC Xu Rui-hua also spoke and expressed his gratitude to the experts and representatives from afar. He pointed out that the meeting is a high-quality oncology forum jointly organized by the China-US Anti-Cancer Association that attracts many elite oncologists from home and abroad for academic exchange. And that the meeting has become a standout platform in China for clinical, basic, and translational research. This was followed by a presentation for the “Outstanding Paper Award for the Conference” to recognize young scholars and students who have performed well in the field of oncology research. Expert scholars who attend the event included Academician Fan Daiming, Academician Yu Jinming, Academician Wang Hongyang, Academician Tian Zhigang, Academician Joesph Sung, Academician Ding Ma, Professor Mien-Chie Hung and Professor Joe Y. Chang both from MD. Anderson Cancer Center, Professor Zihai Li from Hollings Cancer Center Medical University of South Carolina, Professor Rene-O. Mirimanoff of the University of Lausanne, Switzerland, Academician Lin Dongxuan, and Professor Xu Rui-hua from SYSUCC. The morning’s main session topics explored the progress of tumor immunotherapy, targeted treatment of drug resistance mechanisms and its clinical applications, the exploration of new tumor molecular markers, and the multi-disciplinary treatment of cancer and precision treatment practices. There were also 16 specialized cancer-specific sessions for in-depth study and discussion split across the two afternoons. 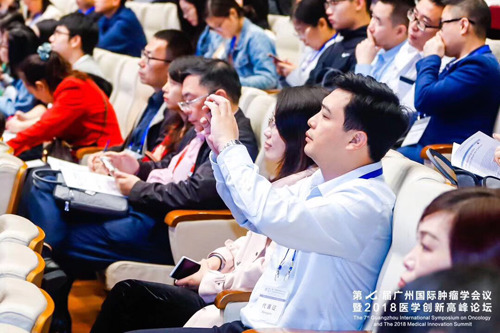 As another positive conference reached its conclusion, the attention now turns towards the 8th Guangzhou International Conference on Oncology in 2019 and the reunion of fellow practitioners in the continued fight against cancer.